This is what we see in the Science Lab of the Healy before the data is processed. It is like a cross-section through the top 50-100 meters of the sea floor. Here you can see it was flat and then climbed uphill. The numbers represent round trip travel time in seconds. Is There a Bird in My Room? When I first got on the Healy, I thought there was a bird in my room. Then I realized the chirp that I kept hearing every 9 seconds or so was not just in my room. It got louder as I went down the ladders to the deepest part of the ship near the laundry. 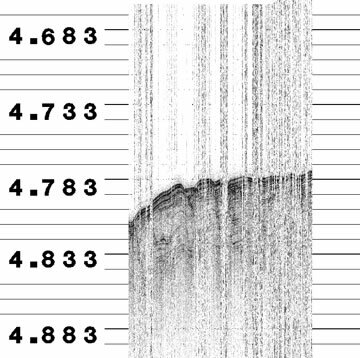 I found out that this chirp is the sound transmitted by the subbottom profiling system. This instrument is being used on the Healy to collect data about the depth of the water and the nature of the sea floor. These subbottom profiler transducers are mounted on the hull of the ship. The “chirp” sound reflects (echos) off the bottom of the ocean and also reveals the sediment layers below the bottom. This is one of the systems I watch on a computer screen when I am working. Sound is an amazing tool in the hands of a geophysicist, who is a person who studies the physics of the earth. The subbottom profiler uses a low frequency sound. Low frequency will penetrate further into the earth than the higher frequencies used by echosounders. This helps scientists to “see” about 50 meters below the surface, depending on the type of sediment (clay, sand, etc). By looking at how the sound waves are reflected back to the ship, scientists can see layering of sediments, infer sediment type (REMEMBER SAND, SILT, CLAY??? ), and sometimes see evidence of channels under the sea floor. The subbottom profiler data is processed and an image is generated for scientists to analyze. This is an image from the 2005 Healy trip to the Arctic. You can see the types of features the sound waves can “see” for us. FOR MY STUDENTS: DO YOU REMEMBER STUDYING SOUND IN 6TH GRADE? WHAT DOES FREQUENCY REFER TO? 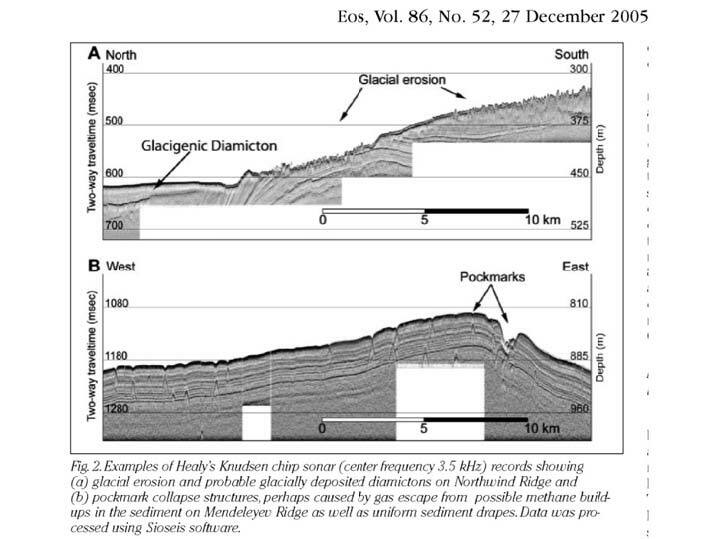 Geologically speaking, the Arctic Basin is poorly understood. We are not sure how some of the major features formed or even where the plate boundaries are. When you look at maps of the tectonic plates, you might notice that they are not clearly marked in the Arctic. Understanding how the sea floor is shaped and what lies beneath will give us clues to understand the history of the Arctic Basin. From a practical standpoint, geology can tell us where important natural resources might occur. When companies are searching for natural gas or petroleum, they are using clues from the geology of the sea floor to decide where to look. As far as I can tell there is no place on a ship where it is completely silent. There are fans, air compressors, engines, doors opening and closing and of course on this ship ice breaking and chirping. 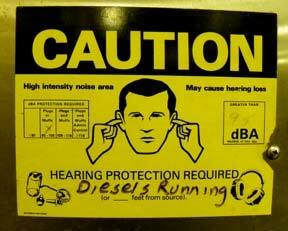 There are some places on the ship where we are warned to use ear protection because the machine noise could, over long periods, cause hearing loss. 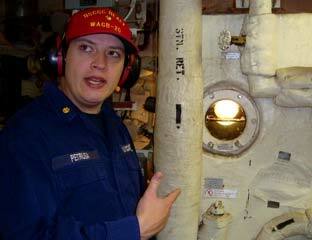 Many doors on the ship have pictures reminding us to wear ear protection in certain areas to protect our hearing. The crew spends time working in areas with high intensity noise – so they are often seen wearing protective headsets. In addition, all over the ship, there are boxes of earplugs. These are available for people to use whenever they need them. My first week, I slept with earplugs every night. The constant chirping, the sound of the engines and the doors opening and closing were more than I could handle. I thought I would need to use earplugs for the entire journey. Now, I am sleeping like a baby even with the additional sound of us plowing through ice. I guess the human body can get used to just about anything. 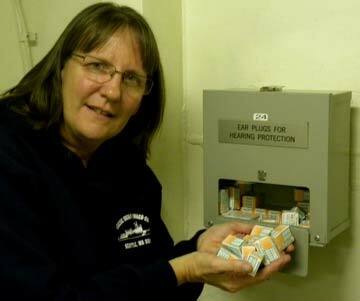 Earplugs are found near every doorway that leads into an area with dangerous noise levels. This entry was posted in 2009, Christine Hedge, NOAA Teacher at Sea and tagged arctic, bathymetry, beaufort sea, contour map, echosounder, noise, Sea Ice, seafloor mapping, USCGC Healy. Bookmark the permalink.